In the world of Minor League Baseball, 2008 may have been the year of the dog, according to Benjamin Hill of MiLB. On January 18 of that year, the Greensboro Grasshoppers announced that the collar of Miss Babe Ruth, the club’s popular Black Labrador, had sold for $290 in a charity auction. Miss Babe Ruth was billed as the youngest bat dog in the history of the Minor Leagues when she made her on-field debut in Greensboro in 2006. Also on January 18, 2008, Maverick the Wonder Dog became part of the Brooklyn Cyclones front office. And just three days later, the Trenton Thunder announced that Chase, their popular Golden Retriever, had fathered a litter of puppies. Chase was actually acquired at the end of the Thunder’s 2002 season. Over the years, he became a disc-chasing community icon. Fans lined up at every game to obtain his paw-tograph. Even Derek Jeter was among Chase’s long list of close and personal friends. Chase retired in 2013, and soon after passed away. 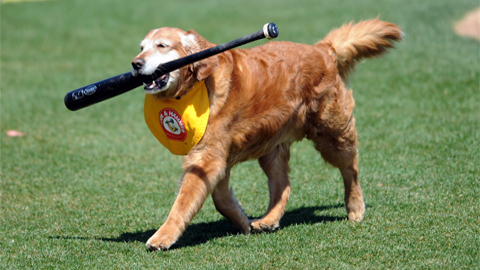 His son, Home Run took over as the lone bat dog for the Trenton Thunder. He even brings water out to the umpires during games. Check out the Chase Video tribute. What a ham. Major League Baseball is catching up. Earlier this year, the Milwaukee Brewers adopted Hank, a stray dog found near the MLB team’s Phoenix spring training facility. He was hungry and scared, and appeared to have been hit by a car. Healed and healthy, Hank now travels with the team. So, now we’re wondering if he’ll be with the team as they meet up to play the Tampa Bay Rays at Tropicana Field on July 28, 29 and 30. We would love Hank to meet Bailey, a Florida Ambassadog for shelter dogs everywhere. Her favorite team is the Tampa Bay Rays, and she loves Joe Maddon (but, has yet to meet him). She even channels Maddon by wearing her own Ray Ban glasses while listening to #Bruce Springsteen. In fact, Glory Days might be Bailey’s favorite song. Just a few years ago, Bailey was 12 hours from being euthanized when a volunteer from the Humane Society of Tampa Bay discovered her, sitting in the back of a crate. She was shivering, scared and had painful tight mats all over her fur. Bailey’s story is like thousands of other dogs waiting to be adopted. Luckily, today she lives a good life, traveling everywhere with her humans, including to Tropicana Field during the Bark in the Ball Park Dog Day. She has also been the Doggie Dining Diva for THE NEW BARKER, contributing as a “restaurant reviewer.” (#Laura Reily and #Jeff Houck, watch your backs…). We know how supportive the Rays have been to local rescue organizations such as Pet Pal Animal Shelter. Could a meet up on the pitcher’s mound between Bailey and Hank occur during the Rays vs Brewers game to show a unified support for shelter dogs everywhere? Stay tuned. THE NEW BARKER plans to lobby for it, and we’ll need our fans’ voices and votes to make it work. Please visit the Event page at THE NEW BARKER on Facebook. Simply cast your vote for either Bailey or Hank by writing a comment as to why you think one or the other (or even both) should step up to the pitcher’s mound on July 30 to throw (or goober) the first pitch. Then share the page to your family and friends. It’s all in good fun to help bring more awareness to the Adopt Don’t Shop philosophy. 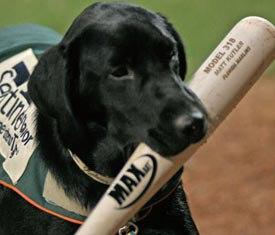 Chase, the official bat dog for the Trenton Thunder. Miss Babe Ruth made her debut with the Greensboro Grasshoppers in 2006. 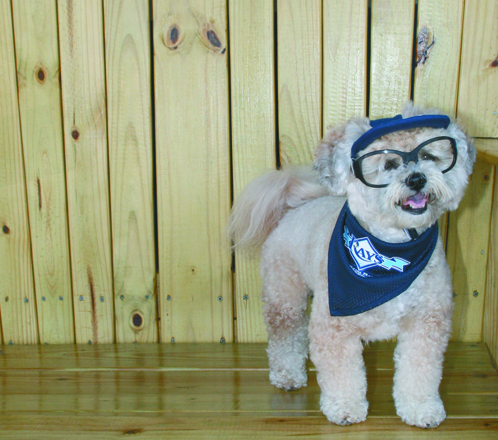 Tampa Bay Rays fan, Bailey and her Joe Maddon Ray Bans. 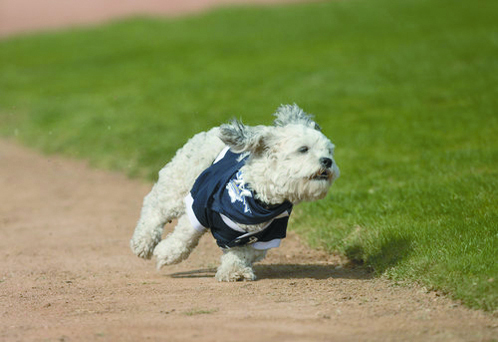 Hank, mascot for MLB’s Milwaukee Brewers, running the bases. Author Anna CookePosted on July 8, 2014 Categories UncategorizedTags Adopt Don't Shop, Dogs, Florida, Humane Society of Tampa Bay, Major League Baseball, Minor League Baseball, Pet Pal Animal Shelter, Shelter Dogs, Tampa, Tampa Bay Rays, The New Barker dog magazine. I’ve always glimpsed your blog in passing. Glad I’m now able to read it. Hi Tigers Militia, glad you’re able to read now as well. Welcome to the World According to ARF. Previous Previous post: Ice Cream Is The Answer. (Who Cares What The Question Is).